Beam Sections can be used for the fabrication of both simple two-dimensional supports and complex arrangements as part of a non-welded support system. 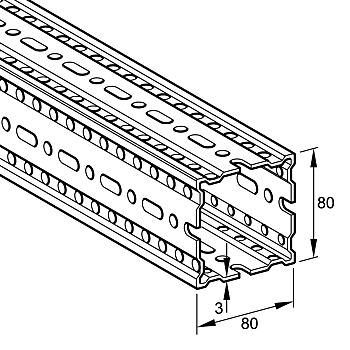 The holes within the Beam Section are designed to receive Self Forming Screws in relation to a relevant component. The 80 x 80 Beam Sections have high torsion resistance allowing for strong volumetric carcasses in both construction and process industry applications, with up to 80% weight saving compared with similar steelwork profiles. Beam Sections have a High Corrosion Protection finish.